I’ve already told you about my satisfaction in the Republican Party primary election finish for two key races for the Texas Legislature: State Sen. Kel Seliger and state Rep. Four Price, both of Amarillo, beat back challenges to win their party’s nomination. In Seliger’s case, he has a token foe this fall, so he’s virtually assured of his re-election. I suffered through my share of GOP disappointments, to be sure. One of them involved the race for Texas land commissioner. I cast my ballot for former Land Commissioner Jerry “The Gun Guy” Patterson, who sought to win his old job back from the incumbent, George P. Bush. Patterson had grown weary of Bush’s scaling back of General Land Office functions, notably its administering of The Alamo in San Antonio. Bush keeps harping on how “conservative” he has been in running the GLO. I’ve long appreciated Patterson on a couple of levels. He had a demonstrated commitment to veterans issues. The GLO administers the state’s veterans home loan program and Patterson — a former Marine Corps pilot — made the issue his own as land commissioner. I get that these personal traits don’t necessarily translate to public policy, but I do find them endearing. Patterson ran for land commissioner after a Texas Senate career distinguished by his authoring the state’s concealed handgun carry bill. 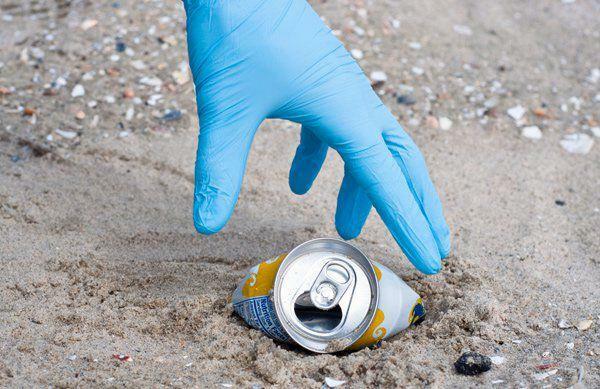 I opposed that legislation when he introduced in the mid-1990s; although I don’t endorse it now, I have come to accept it as the law of the state. Bush is likely to be re-elected this fall. He’ll continue to scale back the GLO’s functions, declaring his actions to be those of a dedicated conservative. Patterson sought to make the case that the Land Office needs to step up to take care of state treasures, such as The Alamo. He didn’t make the case to enough Republican Party primary voters. It turns out that former Texas Land Commissioner Jerry Patterson has a particular motive for seeking to get back into his former job. He is angry at the way the current commissioner, George P. Bush, has handled the Alamo. Bush has taken the Alamo restoration efforts away from the General Land Office and put it in the hands of private concerns. Patterson doesn’t like that. So he’s aiming to do battle with Bush with the idea of returning to the GLO the idea of caring for the Alamo. As R.G. Ratcliffe writes in the Burka Blog: During Patterson’s tenure, the famous Texas battleground was transferred from the Daughters of the Republic of Texas to the land office, but Bush has been widely criticized for handing off restoration plans to private foundations. Ratcliffe reports that legislators are critical of the move because the foundations are too secretive and aren’t being held accountable for what they’re doing to restore the Alamo. 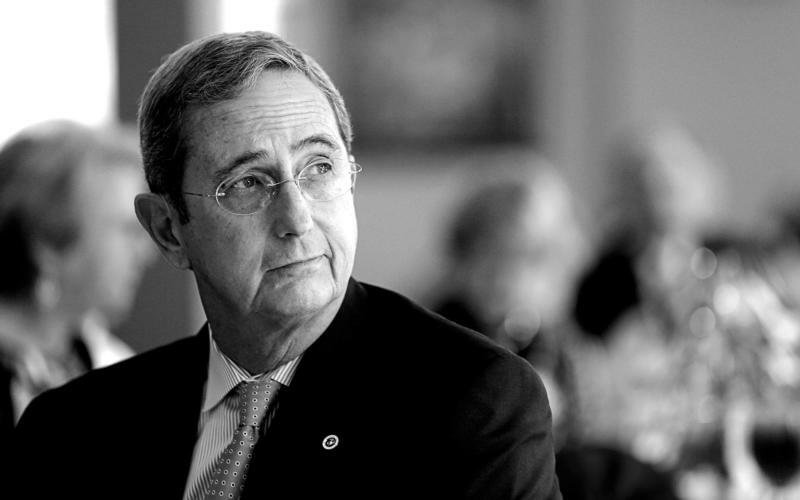 Patterson contends, according to Ratcliffe, that Bush set up the privatization arrangement so that he could take credit for cutting the size of a government agency. Patterson says he doesn’t want a job. He said he decided to run because he couldn’t find another Republican to challenge Bush. He told Ratcliffe that Bush is too enamored with being a “small-government Republican” intent on cutting the budget. Patterson is angry that Bush has dismantled the GLO’s hurricane response that Patterson created; as a result, there have been delays in getting aid to Hurricane Harvey victims along the Texas coast. Patterson is having none of it. He wants to challenge Bush, whose campaign team is touting as the “most conservative land commissioner” in Texas history. This might shape up to be a most fascinating Republican Party primary. I get the appeal that Bush is seeking to parlay as a budget cutter and a small-government kind of politician. I happen to be more of a “good government” fellow, who hopes that Patterson — one of my favorite Texas politicians — can mount a serious challenge to the fellow who succeeded him. 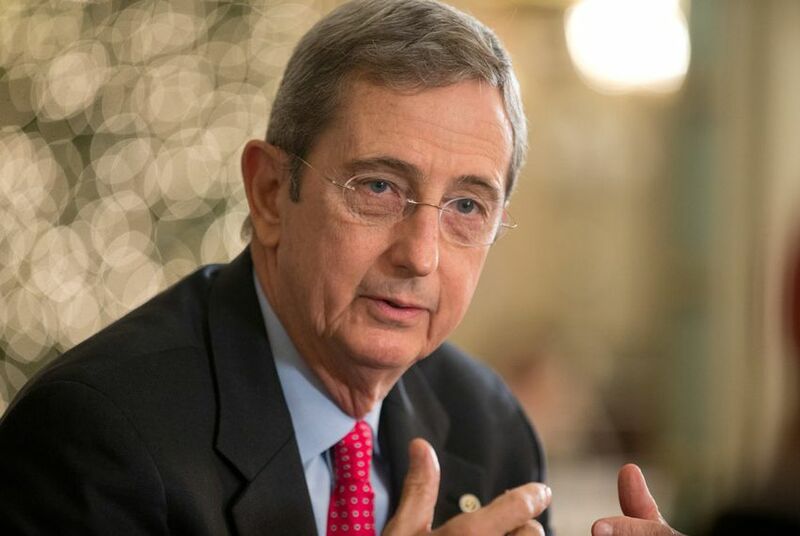 Jerry Patterson wants his old job back. What is that? He is the former Texas land commissioner who four years ago decided against seeking a third term. His successor is George P. Bush, the grandson and nephew of two former presidents of the United States. Patterson doesn’t think Bush has done well at the Land Office. He considers him to be too much of a politician with his eyes seemingly on grander political prizes. So the former Texas state senator who once was known primarily for authoring the state’s concealed handgun carry legislation in 1995 is wanting to get back into the political game. I welcome Patterson back. 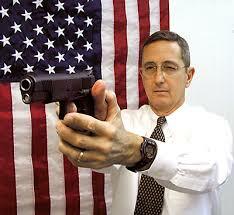 The former “gun guy” is going to liven the Republican Party primary if he actually takes the plunge. I remember meeting him years ago during his time as land commissioner. I found him to be self-deprecating yet smart at the same time. I recall him mentioning how he finished “in the top 75 percent of my class at Texas A&M.” He was acutely aware that his primary legislative accomplishment — enactment of the concealed carry bill — would brand him with the “gun guy” moniker. Those two matters endeared him immediately as someone who did not take himself as seriously as he takes his public service responsibility. I’ve never met George P. Bush, although I do remember him speaking on behalf of “Poppy” Bush during the 1992 Republican National Convention in Houston. The youngster stood at the Astrodome podium as a 16-year-old and declared “Viva Boosh!” in an appeal to Latino voters, given that his mother is an immigrant from Mexico. He brought the house down. The next time I would see his name would be during the 2014 campaign for Texas land commissioner. Patterson seems to be primed for a tough battle against the incumbent, according to the Texas Tribune: “Patterson has been a regular critic, recently sending an editorial contrasting the land office’s response to Hurricane Ike, when he was in charge, with his response to Harvey this year. “Harvey victims still living in tents along the coast are, at least in part, victims of a politician’s desire to look good for the next election by being a ‘small government Republican,'” Patterson wrote in what looks like a preview of his political campaign. This could be a fascinating campaign to watch. Go for it, Mr. Gun Guy! 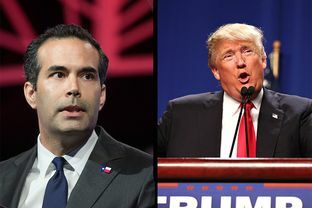 Texas Land Commissioner George P. Bush has swilled the Donald J. Trump Kool-Aid. He says it’s time to support the Republican Party’s presidential nominee. George P. hasn’t exactly “endorsed” Trump, who performed a major hatchet job on the young land commissioner’s father, Jeb Bush, during the GOP primary. Trump’s campaign so angered others in the iconic political family that the Bushes’ two former presidents — George H.W. Bush and George W. Bush — stayed away from the Republican convention in Cleveland. So did Jeb, of course. According to the Texas Tribune: “From Team Bush, it’s a bitter pill to swallow, but you know what? You get back up and you help the man that won, and you make sure that we stop Hillary Clinton,” Bush said, according to video of the remarks provided by an audience member. There you have it. The goal is to “stop Hillary Clinton,” the Democratic nominee. No matter what. Regardless of how Trump trashed P.’s own father, how he said Uncle W. deceived the nation and lied us into war in Iraq. Politics at times produces the strangest alliances imaginable. John Ellis Bush is no more Hispanic than his mother, father or his four siblings. He’s an Anglo-American. But in 2009 he put “Hispanic” on his voter registration form. Thus, the 2016 presidential campaign comedy of errors has begun — and John Ellis Bush, aka Jeb, isn’t even an official candidate for president. PoliticsUSA, a left-leaning website, says Jeb Bush committed a third-degree felony by registering falsely when he listed his ethnicity as Hispanic. Those folks are all up in arms over it, complaining that the media are giving Bush a pass. What does PoliticsUSA want to happen to Bush? Toss him in jail for committing a third-degree felony six years ago? I’m not willing to slap irons on the former Florida governor’s wrists and/or ankles. Hey, perhaps he was thinking of his wife, Columba, who was born in Mexico. She’s Hispanic, for sure. So are the couple’s children, the most notable of whom is George P. Bush, the newly elected Texas land commissioner. My favorite memory of George P. Bush is watching the then-teenager at the 1992 Republican National Convention in Houston extolling the virtues of his grandfather, President George H.W. Bush, who was seeking re-election. “Viva Boosh!” shouted George P. from the podium that day — bringing down the house in the Astrodome. Jeb Bush will get past this little kerfuffle. Just a reminder, though: John Ellis Bush, you are an Anglo. Keep it straight in the future, all right? It’s good to be one of the Big Dogs when it comes to electing presidents of the United States. Texas is big. And on March 1, 2016 the state is going to have its primary election, meaning that it’s going to be one of the first states to select delegates to the Democratic and Republican national conventions. The state is going to be a player in the next presidential election cycle, judging by the early interest by a gang of potential GOP candidates who are coming to the state in search of cash and even some votes. In an interesting twist, several of the potential GOP candidates have strong Texas ties. * Sen. Rand Paul of Kentucky was born here; his dad, former U.S. Rep. Ron Paul, has run for president twice already while serving as a congressman from the Houston area. * Former Florida Gov. Jeb Bush also is a Texas native; his son, George P. Bush, has just taken office as state land commissioner. Jeb’s brother, George W., was Texas governor before being elected president in 2000 and his dad, George H.W., served in Congress from the Houston area before he was elected vice president in 1980 and then president in 1988. * Ted Cruz represents Texas in the U.S. Senate. * Rick Perry is a former Texas governor and holds the record for longevity in that office. And for the Democrats? Well, some folks have tried to suggest that Hillary Rodham Clinton has a Texas connection, too, having worked with her husband, Bill Clinton, as Texas campaign coordinators for the late Sen. George McGovern’s presidential campaign in 1972. Aw, what the heck. Let’s allow her to claim some Lone Star State roots, too, shall we? Welcome back to the Big Show, Texas. One of the least surprising results of next week’s statewide election will be who wins the race for Texas land commissioner. Ladies and gents: Welcome George Prescott Bush to the roster of constitutional elected officials. You know this young man, yes? We’ll call him “P,” which is what his family and close friends call him. His uncle George W., after all, has been called Dubya since, oh, he became president of the United States back in 2001. The Texas Tribune has put together an interesting analysis about “P” and how his new office is going to gain considerable attention once he takes the oath of office. George P. is the son of former Florida Gov. Jeb Bush and is the grandson of former President George H.W. Bush. I’ve already mentioned Uncle Dubya, which puts “P” in line to be the first of the next generation of men named Bush to ascend to public office. Grandpa Bush famously referred to “P” as one of the “little brown ones,” given that the young man’s mother is Hispanic. Does “P” bring a lot of practical experience to the job of land commissioner? Only a little. He’s a lawyer and his name is Bush. That’s it, plus his work as an oil and gas consultant. He will oversee the management of public lands in Texas and the royalties it earns from oil and gas revenue for public education, and will manage the state’s veteran home loan program. It’s the latter duty that likely will comprise the bulk of his time and attention, given that so little land in Texas is in public hands. The fact someone with the Bush name will be running the General Land Office gives the office needed visibility. It’s an important office that does important work on behalf of public school students and veterans. I won’t go too far out on a limb here to suggest that “P” is using the GLO job as a stepping stone to something flashier. George P. is just in his 30s and he’ll have a whole host of options available to him in the future. For now, though, he’s going to get his feet wet at the General Land Office. Hey, he’s aimed high and is using his still-potent family name — it still carries some weight in Texas, at least — to hit his target.